Sail from New York on the completely refurbished Carnival Sunrise, with brand new cabins, water park and top-deck features and new dining options. 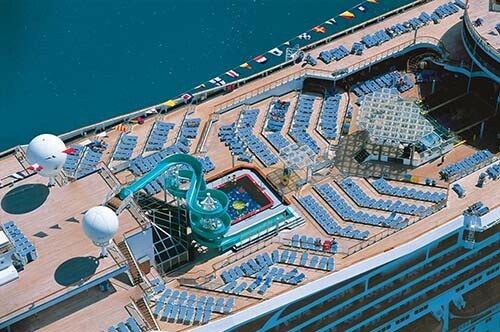 This cruise stops in the Turks & Caicos; San Juan, Puerto Rico; Amber Cove (Puerto Plata); and the Dominican Republic. The Carnival Sunrise is one of two ships in the Modified Destiny Class from Carnival Cruise Line with sister ship Carnival Victory. Built in 1999, the ship was completely refurbished in 2016. With space for more than 2,700 passengers and a crew of 1,100, the Carnival Sunrise offers great deals on Caribbean cruises. Whether you’re traveling alone, with your spouse, or planning your annual family vacation, there’s a perfect stateroom to accommodate your needs. Find the best cruise specials from Dunhill Travel Deals and save on your next cruise vacation. All staterooms on the Carnival Sunrise include a TV, telephone, in-room safe, hairdryer, mini-bar, private bathroom with shower, plush bathrobes, writing desk with chair, generous closet and dresser space, and Carnival Comfort Collection linens. The largest room available, the Grand Suite has a private 85 sq. ft. balcony, a king-size bed, walk-in-closet, private bathroom with a shower/whirlpool tub combination, dual sinks, bidet, plus a living area with a sofa bed, desk and vanity, coffee table and chair. Features a private 65 sq. ft. balcony, a king-size bed, walk-in-closet, private bathroom with a shower/whirlpool tub combination and dual sinks, plus a living area with a sofa bed, desk and vanity chair and table. Has a 35 sq. ft. private balcony, a king-size bed, walk-in-closet, private bathroom with a shower/whirlpool tub combination plus a living area with a sofa bed, desk and vanity. Located on the aft section of the ship, these rooms have floor-to-ceiling glass doors leading to a furnished 75 sq. ft. private balcony, lots of closet space, a bathroom with shower, a living area and twin beds that convert to queen-size. Features floor-to-ceiling glass doors leading to a 75 sq. ft. furnished, private balcony, lots of closet space, a bathroom with shower, a living area and twin beds that convert to queen-size. Features a balcony balcony that is 50% larger than standard balconies. These rooms, on the aft section of the ship, are the perfect size for two guests. Size: 185 to 195 sq. ft.
Has incredible floor-to-ceiling glass doors lead to a 35 sq. ft. furnished, private balcony, lots of closet space, a bathroom with shower, a living area and twin beds that convert to queen-size. Roomier than Interior Staterooms, these rooms have a scenic picture window and depending on the layout can accommodate up to 5 guests. Note some cabins in this class have obstructed views. All the features of an Interior Stateroom plus a picture window with views partially obstructed by the ship’s lifeboats or other ship structures. Has a pair of port hole windows, two twin beds that convert to a queen-size bed, generous closet and storage space, a private bathroom with shower and a comfortable living area with a coffee table and seating. Most interior staterooms come standard with two twin beds that convert to a queen-size bed, generous closet and storage space, have a private bathroom with shower and a comfortable living area with a coffee table and seating. Features a pair of round windows providing an affordable ocean view. These rooms have a single twin bed plus an upper bunk bed, generous closet and storage space, a private bathroom with shower and a comfortable living area with a vanity and seating. Has a single twin bed plus an upper bunk bed, generous closet and storage space, a private bathroom with shower and a comfortable living area with a vanity and seating. 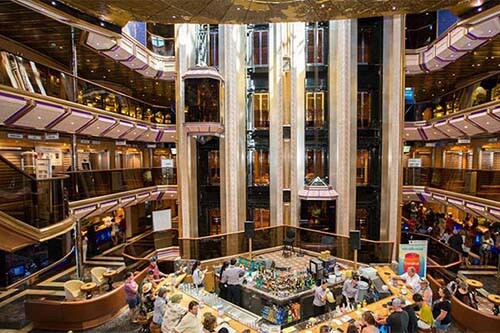 Play the slot machines or try your luck at a game of chance at the ship’s casino. Order your favorite cocktail at Alchemy Bar, EA Sports Bar, RedFrog Rum Bar, or the BlueIguana Tequila Bar. Work on your health and wellness, take a class at the fitness center, run a few laps around the jogging track, or book a massage at the spa. Children and teens of all ages will enjoy kid-friendly activities like Make Your Own Pizza, Bearly Cuddly Workshop, Kid’s Party Time, and the Underground Tokyo Video Arcade. Catch a show at Carnival’s Seaside Theater, listen to live music at the Piano Bar, or catch the latest comedy routine at the Punchliner Comedy Club presented by George Lopez. No matter what you’re craving, there’s a variety of casual cuisine and fine dining options to choose from on the Carnival Sunrise. 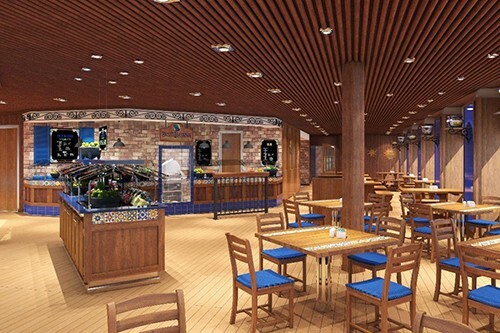 Grab a taco or burrito at BlueIguana Cantina, chomp on a juicy burger at Guy's Burger Joint, or watch the ship’s Master Chef prepare a multi-course meal at the Chef’s Table. Green Eggs and Ham Breakfast - Family-friendly breakfast experience themed like the world of Dr. Seuss with aesthetic and punny (as well as classic breakfast) menu items! Chef’s Table - VIP dining experience featuring a multi-course dinner prepared by the ship’s Master Chef for $75 per person.